Aluminium French doors are one of the most stunning home improvements that you can choose in the UK. These spectacular double glazed doors offer versatility, beauty and performance across the board. Here at Sternfenster, we fabricate high quality aluminium French doors that are meticulously crafted to the exact specifications provided by your double glazing installer. Our UK based manufacturing centre can send our outstanding aluminium French doors to any tradesperson in the UK, so you can count on exceptional quality every time because we only work with the best installers, guaranteeing a perfect fitting. 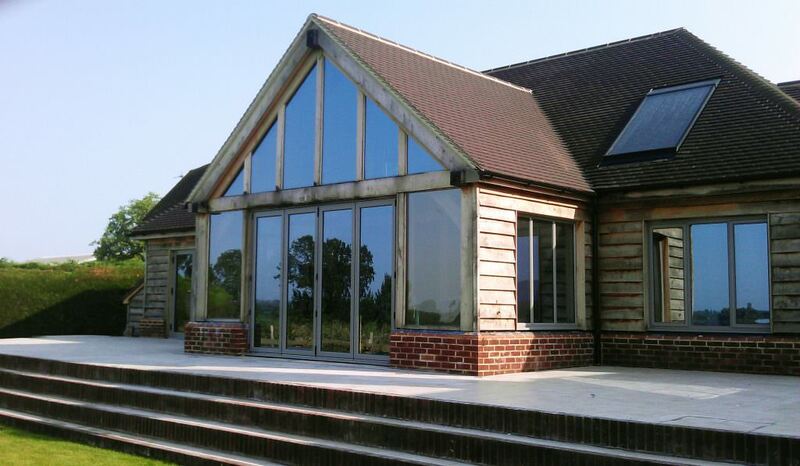 We know that aluminium French doors are incredibly sought after, offering exceptional standards across the board. With an aluminium French door you can have an incredible feature in your home that provides outstanding efficiency and security, so read on to find out more about these impressive UK home improvements. Aluminium French doors are perfect for any UK property, new or old, modern or period; they can be adapted to suit your home. This isn’t the only versatile aspect of these superb doors; they are also adaptable for a variety of openings. If your home has a balcony, either a standard open space of any size or a Juliette balcony that is there to offer a stylish look to your property, then our French doors are ideal. They can open inwards as well as outwards, enabling them to be used in any space throughout your home. Perfect for creating a stylish and elegant feature! Perhaps you have a garden or patio, again, our aluminium French doors will be perfect. Available with a variety of threshold options, they can be adapted to meet your needs and the space you have. They even come with an ultra-low threshold that is the perfect option for easy accessibility. Aluminium French doors will enable you to enjoy the highest degrees of natural light possible through the larger than average glazing, made possible by the incredibly slim frames present throughout the door design. You will be able to enjoy a beautiful and appealing feature in your home, wherever you choose. Aluminium French doors are not a one size fits all option. Your double glazing installer will be able to offer you so many options to tailor them to your needs. You can choose sidelights, designed to extend the width of your French doors so that you get a great wall of glass. With aluminium French doors, the frames are exceptionally slim because aluminium upholds impressive standards of innate robustness, which enables you to enjoy a superb viewing area. Our aluminium French doors are also available in almost any colour finish you can think of. If your UK home is traditional and needs a look that blends in with the surroundings, complementing its style and the area where you live – then choosing from the beautiful muted shades available is the ideal decision for you. Maybe you have a modern home and you want to create a standout, striking feature. We have a range of colours that will be the ideal match! Bright yellows, purples and pinks will help you create a stunning contrast to your brickwork and a focal point of your French door. Many of our trusted double glazing installers will also offer you the chance to have dual colours so that you can have a shade on the external frame that ties in with your property and a different tone on the inner frame to complement your interior décor. Aluminium French doors offer UK homes so much style; it’s not difficult to see why they are so incredibly popular. Our aluminium French doors are manufactured by Smart Architectural Aluminium, meaning that we can fabricate market leading systems for your home. Aluminium French doors need to be energy efficient to meet Building Regulations. 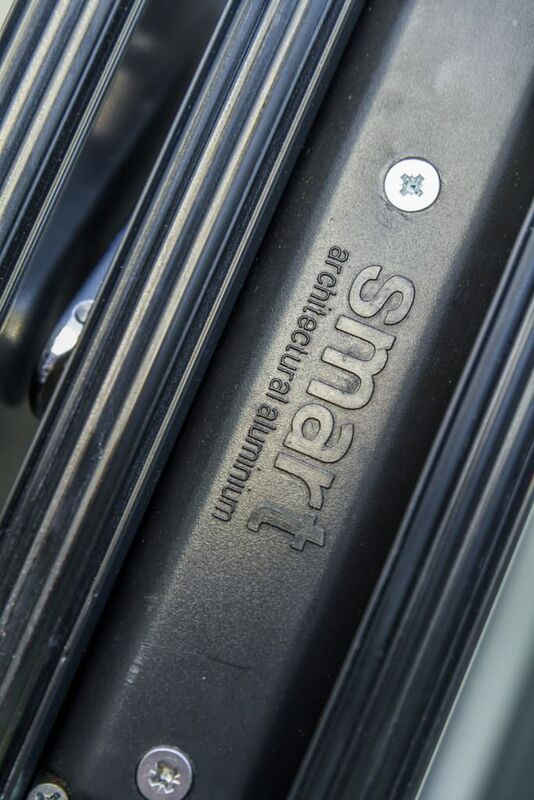 One of the outstanding benefits of the Smart aluminium door designs is that they are British designed to meet the challenges of our weather system in the UK. This ensures that they can withstand even the worst winter storms and protect your home from the very coldest weather. The aluminium profile is thermally broken, so there is a gap within the frame that traps air by creating a thermal barrier. Our aluminium French doors will ensure that heat loss is completely minimised and that absolutely no draughts can enter your home. Of course, the benefit of this is that your home traps heat, making it warmer for longer. In turn, you need to use less heating to keep it at a comfortable temperature, causing your energy bills to lower. This is just one of the many cost effective features that aluminium French doors offer to UK customers. Looking for a Highly Secure Door? When it comes to security, nothing is as high performance as aluminium doors. The natural strength that aluminium provides makes the profile incredibly effective against attempted break-ins. They really are one of the most secure options for your home in the UK. Of course, this strength would be wasted if it wasn’t supported by a great locking system, and with our aluminium French doors, we can install high security multipoint locking systems when we fabricate them. You will benefit from complete protection for you and your family. As if this wasn’t enough to keep you safe, one of the benefits of the Sternfenster aluminium French door is that we ensure they are internally beaded. This means that the glass is sealed from the inside making it impossible for it to be removed from the outside. Aluminium French doors may look slimline and dainty, but they are in fact super secure, protecting your UK property and your family from even the most determined of intruders. This is one of the many benefits of choosing aluminium French doors for your UK home, and it is one of the countless reasons that they are such an incredibly popular home improvement option. Our aluminium French doors will provide your home with an element of European charm. They are full of character and style, enabling them to enhance the aesthetics of any UK property. However, when you choose one of our affiliated installers, you get the best of both worlds. European flair made with British design and technology. Our beautiful aluminium French doors are in fact made in the UK! Because of this, they are uniquely crafted to offer the best performance for UK households and the UK climate. It also helps with their unrivalled eco-friendly performance. With aluminium doors, you benefit from completely environmentally friendly products. We all want to ensure that our carbon footprint is as low as it can be as well as keeping our impact on the environment as minimal as possible. 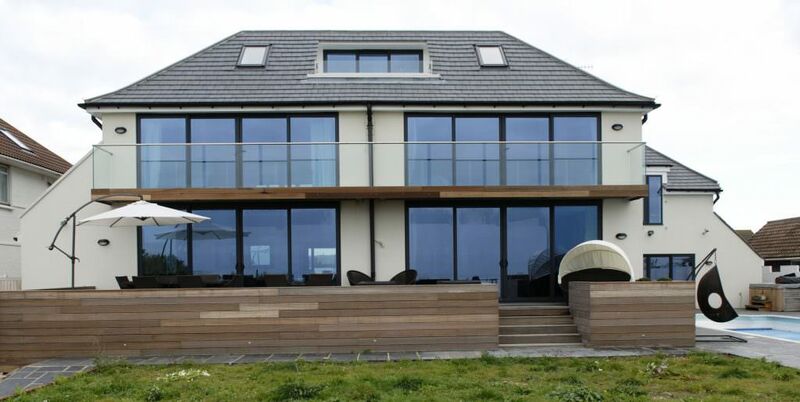 Aluminium is the perfect product for environmentally conscious UK homeowners. It is exceptionally recyclable. With our fabrication and manufacturing being based in Britain, our aluminium French doors also don’t have to travel far to get to you, cutting down on emissions. 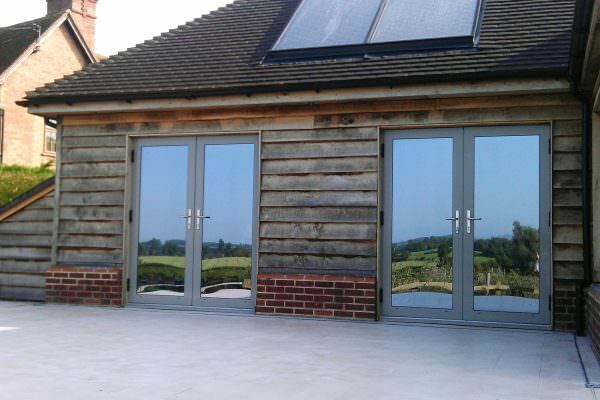 All in all, aluminium French doors are the very best choice for eco-friendly home improvements in the UK. Finally, when you choose aluminium French doors, you are choosing a product that is designed to last for many, many years. Aluminium is incredibly durable and robust, offering itself as one of the hardest wearing options for double glazing in the UK. With aluminium French doors from Sternfenster, you can count on this durability to provide you with outstanding performance and operation over an extensive period of time. Our aluminium French doors don’t even require extensive maintenance, making them an effortless option for your home improvements. Simply give them the occasional clean and they will continue to operate to the highest standards, looking just as beautiful as they did on the day they were installed. Wherever you are in the UK, we have a trusted double glazing installer that is near to you and is an expert with the Sternfenster range. Our installers are highly regarded in their local area, and all of them offer superior quality in their installations. You can find a double glazing installer near to you who will be able to offer our spectacular aluminium French doors simply by visiting our postcode checker. Enter your postcode and we will provide you with the contact information for a selection of Sternfenster approved installers in your area. Your new aluminium French doors are simply a click away, so find your trusted local installer now!